Our fears are usually worse than the reality - but not always. Sometimes, things are even worse than we fear. 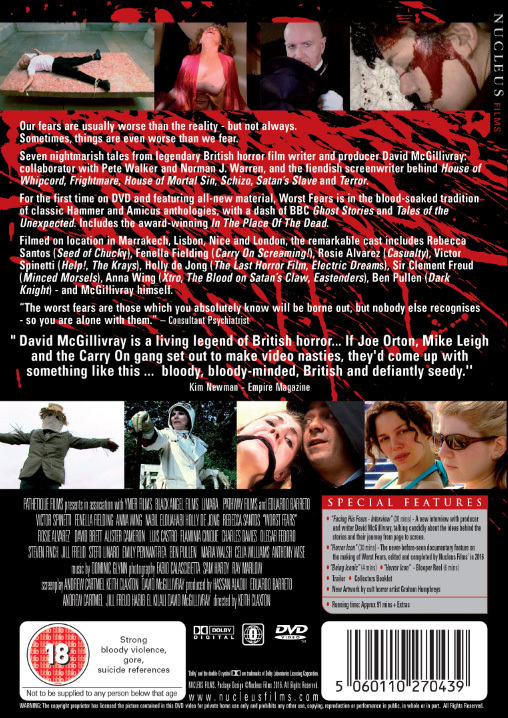 Seven nightmarish tales from legendary British horror film writer and producer David McGillivray: collaborator with Pete Walker and Norman J. Warren, and the fiendish screenwriter behind House of Whipcord, Frightmare, House of Mortal Sin, Schizo, Satan’s Slave and Terror. For the first time on DVD and featuring all-new material, Worst Fears is in the blood-soaked tradition of classic Hammer and Amicus anthologies, with a dash of BBC Ghost Stories and Tales of the Unexpected. Includes the award-winning In The Place Of The Dead. Filmed on location in Marrakech, Lisbon, Nice and London, the remarkable cast includes Rebecca Santos (Seed of Chucky), Fenella Fielding (Carry On Screaming! ), Rosie Alvarez (Casualty), Victor Spinetti (Help!, The Krays), Holly de Jong (The Last Horror Film, Electric Dreams), Sir Clement Freud (Minced Morsels), Anna Wing (Xtro, The Blood on Satan’s Claw, Eastenders), Ben Pullen (Dark Knight) - and McGillivray himself. "The worst fears are those which you absolutely know will be borne out, but nobody else recognises - so you are alone with them. Facing His Fears - A new interview with producer and writer David McGillivray, talking candidly about the ideas behind the stories and their journey from page to screen. Rebecca Santos, Fenella Fielding, Rosie Alvarez, Victor Spinetti , Holly de Jong, Sir Clement Freud, Anna Wing, Ben Pullen, David McGillivray.